Fugazi’s 1993 album In On The Kill Taker is considered a classic entry in the band’s catalogue due to its propulsive songs and its challenging jagged edges. But an early, discarded draft of the record earned a mythology of its own. 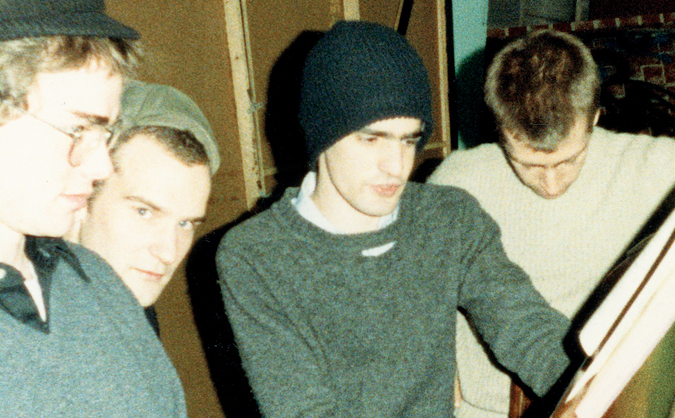 Before recording the final Kill Taker draft, Fugazi recorded demo sessions with engineer Steve Albini. Albini had accrued an outsized reputation for his no-frills approach and recordings that made listeners feel like they were standing in the room with bands including Pixies and The Jesus Lizard. Fugazi were used to working independently. However, 1991’s self-produced Steady Diet of Nothing left the band wanting more. Fugazi’s Guy Piccioto told author Brandon Gentry, “I appreciate Steady Diet for a lot of things, but there was a flatness to both the performances and the sound that was weird to us.” It was time to try something different. According to the book Fugazi’s In on the Kill Taker by Joe Gross, Albini had offered to record Fugazi for free. Ian MacKaye decided to take him up on his offer, and the band headed to Albini’s home studio for sessions in November 1992. The band recorded twelve tracks with Albini, and left feeling that they’d captured their best work to date. But things looked different the morning after. Sometimes, all it takes is one good night’s sleep in order to gain a new perspective on your work. On the drive home from Chicago, Fugazi listened to cassettes of the recording. After conferring, they agreed: “This is not a good recording.” Albini soon sent the band a fax that concurred. “I blew it,” he wrote. Albini and the band all felt that they’d experienced a great sense of camaraderie during the sessions – but the results were lacking. The Albini sessions were scrapped and Fugazi returned to their home base at Arlington’s Inner Ear Studios in order to record their new – and final – version of In On The Kill Taker. They were assisted by co-producer Ted Nicely (who had collaborated on the band’s earliest recordings). The Albini sessions became the stuff of lore. This was, after all, a dream union of a legendary band with a legendary producer. The sessions have since been widely distributed online. Listen to excerpts of the recordings below. For more Fugazi stories, listen to Ian MacKaye on the Culture Creature podcast.